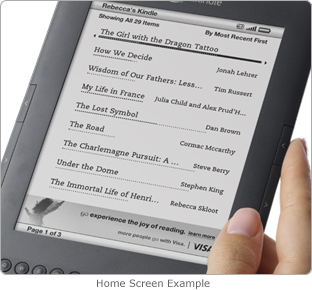 Yesterday Amazon announced an addition to the latest generation of Kindles! They brought us the new Amazon Kindle with Special Offers - now available for pre-order to ship on May 3. Goodness, emotions seem to be flying on this one! Forget more more choice, let's get the mob going! Well, not me. I am firmly of the opinion that if there are choices and I can choose this version over the regular version, then cool - horses for courses, each to their own. etc etc. Bring on the choices. Why do I call them K3? Well this blog covers all Kindles and a lot of us still have older generations that have some different abilities, so I refer to those as K1 and K2. So, what do you think? Scanning kindle forums and communities I hear shrugs, I hear yays, I hear screams. Once of the screams is obviously about ads on Kindle. 3, ads won't appear on your reading page, but in sponsored screensavers and the bottom of your homepage. See left for an example of an ad on the homepage. I hear complaints that you wanted to choose a screensaver. Well, I've kinda figured for about a year, the screensaver was a perfect place for some "coming soon" book promos. Of course, someone might come out with a new screensaver hack, and if they do I think it's very plausible that Amazon will clamp down. It's already against Terms of Service but Amazon have ignored it so far; but by buying this you are agreeing to have these sponsored screensavers that companies pay for, and I am quite sure that paying companies will want to be sure their paid ads are being seen before they pay up the dough. Big deal! What can they do about it? They can shut you off. De-register you, close your amazon account. Your Kindle will still work but not with Amazon's services, including wireless access. You'd have to find somewhere else to buy your books. They haven't done it so far, but they have that right. ii) the ability to set preferences for your Kindle, such as fewer images of animals, more of trees etc etc. I barely notice the screensavers I have since I use a cover and am very good at zoning out of things that don't excite me, so I'd be fine with it I think. My prediction... I'll go out on a limb and predict Amazon will offer low price screensavers that you can buy for your Kindle, say 99 cents for new images, or $4.99 for a set of 10. I hear fits that you paid $139 last week. Then you can take advantage of Amazon's amazing return policy - no quibble for 30 days. Send it back and get the new one. But don't complain about the ads on the lower priced one. Well that's technology for ya! I paid $360 two years ago, plus the warranty and a cover and a light, that was over $500 total. I've seen several price drops since and with each one, people get angry! Why?? Don't we want technology to progress? For companies to compete and offer better products at lower prices? So more people can get one of these brilliant products and read more books? Would I change anything if I knew the prices would drop so low? Would I wait longer to get it? No! How long should I wait? 3 years till it goes from $360 to maybe $99? 5 years and it'll have a built in alarm clock? What about the special offers? This I like! I like the option of lower price gift cards. I am thinking it's a nice way for Amazon to get round the crappy Agency Model that won't let them discount books. But it's a payoff, right? Consider it like paid ads... you get paid to have ads on your screen! I wish TV were like that! I pay a lot of money for cable TV but I am bombarded with commercials every 8 minutes on some channels. Wish they'd send me some half price coupons for putting up with it. What was that scream? We should all get half price coupons if we paid more for Kindle? I agree with you, the current screen savers don't bother me, as with you I have a cover and I basically just ignore them. I also agree with you in that if you just bought a $139 Kindle you shouldn't get coupons. If you went to a dealer and bought a brand new car and 2 weeks later they had that car on sale you don't get coupons for that car! Some people just like to complain and get a mob going just to hear the mob. I am sure people will get over it. Hope so, anyway! This is a CHOICE. Amazon isn't shoving the K3-SO down consumers throats. The buyer knows, up front, that there will be ads, and coupons. I can't say that there are a lot of places that do this. Such as many social websites - you're not told about ads because it's a given. Then, if you want to use their service (which some folks have little choice about) you have to put up with ads. I think this new Kindle is just fine. It makes the reader more affordable, and if the ads really, really annoy you, get the $139 unit. If I could justify another Kindle, I'd get this one just to see what, exactly, goes on with it. That's a really good point Jayne... knowing up front. Ads and coupons are everywhere (looks left and right at own blog). I could see people people upset if the original ad-free were taken away but that's not the case. On another Kindle blog I read, I Love My Kindle, Bufo had predicted a long time ago that that ads could be inserted into books even to get free books - I remember that years ago, little postcards falling out of books. I'd probably buy a discounted e-book if it had an ad in the front or back - maybe not the middle, but out the way.